The WAFC Reconciliation Action Plan aims to build upon the strong relationship between Aboriginal people and the Western Australian football community. In doing so the RAP will continue to grow this relationship, increase respect and recognition and provide further opportunities for Aboriginal people to participate in all aspects associated with football in Western Australia. In addition the RAP will improve social relationships between Aboriginal and non-Aboriginal Western Australians. The Nicky Winmar Carnival was originally created to provide young Aboriginal youth with another platform to enter the WA Football talent pathway. The carnival targets disengaged players with the aim of getting them back into the football system at club level and in development squads. The Inaugural cup was held in 2007 and consisted of five teams. The overall goal of the carnival is to increase the amount of Aboriginal youth playing at community club level and representing their WAFL Zones in development squads. The Nicky Winmar Carnival is played in a round robin format over one day. 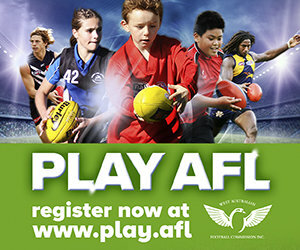 Competing teams are based on WAFL metro and regional zones. All teams are coached by Aboriginal coaches. The carnival also provides participants and coaches with the opportunity to be selected into the WA KickStart U15 State Aboriginal Squad who compete at the national KickStart National Championships. The KickStart Program was developed to provide a supported talented player pathway program that compliments the National U16 Championship and exposes Indigenous players, coaches, doctors, physiotherapists and trainers to an elite AFL program environment. The WA KickStart team and coaches are selected based on performances at the Nicky Winmar Carnival and recommendations from player development officers and other talent identification staff. The AFL and Rio Tinto have set a 100% target for the participants to be engaged in employment/education or training at the completion of the program. Successful employment outcomes also include assisting participants to transition from employment within a community organisation to mainstream employment. The WA Football Commission Supports the Footy Means Business program by assisting in the identification and coordination of all WA based participants. The WAFL NAIDOC Round was instigated by South Fremantle and Claremont instigated the event in 2007. NAIDOC Round at the WAFL coincides with the National Aboriginal and Islander Day Observance Committee (NAIDOC) week celebrations, which are held annually across Australia to celebrate the heritage, achievements and culture of Aboriginal and Torres Strait Islander peoples. All WAFL clubs playing in the Round will wear uniforms designed to represent the heritage of the clubs and their indigenous players. Aboriginal artist Richard Walley teamed up with the WAFL to create the majority of jumpers, while the Department of Indigenous Affairs funded their production. The South-East Engagement (SEE) Project aims to use football as a vehicle to promote community harmony and social inclusion and to also improve education, employment and health. The project targets Indigenous youth that are based within the South-East Metropolitan Area. The South East Engagement Project was developed following a formation of a key partnership between the WA Football Commission and the Department of Aboriginal Affairs. Today the AFL Indigenous Round is a celebration of our country's Indigenous culture and players that have shaped Australia's Game. A game that unites us all, players and fans, standing strong and proud for the past, present and future generations. The WA Football Commission proudly supports the AFL Indigenous Round through assistance in promotion and coordination of the round to the local community. The WA Football Commission also coordinates a curtain raiser featuring two Indigenous teams from WA. The curtain raiser is played prior to the official AFL Indigenous Round fixture.